Audi S4 Avant: driven | What Car? There you sit at the lights, de-restriction sign just ahead this seems like a pretty good time to be in an Audi S4 Avant. Lights change, foot down, whoomph in the back although perhaps not quite as hard as you might have expected it somehow feels that a few of the 328 horses under the bonnet have wandered off. 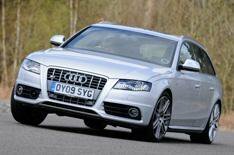 Still, you'll get up to speed indecently quickly, and the S4 is a reasonably refined companion, road noise excepted. The problems arise at the first corner; the steering, although sharp, offers virtually no information about what kind of a fight the front tyres are putting up. The nose certainly turns into corners quickly enough, but the rest of the body takes a second to decide how it's going to follow so you feel like there's a slight delay before it leans over and the rear tyres grip properly. Still, you get a stylish cabin and great seats (albeit with the A4's traditionally offset driving position), while the optional S tronic gearbox is smooth, responsive, and a great addition. These aren't enough to make up for the disappointing road manners though there were better cars to be in at those lights after all.